Start watering cacti when temperatures start to rise in spring. Stop watering when autumn approaches. In springtime and when cacti are growing and flowering they need more water. Some of them start to flower even from February! They can be watered, although its not really spring. Some of my cacti flower in autumn. Even if I don't water my other cacti, I continue watering them for a month. In winter I leave my cacti completely dry. Never put an under pot, because your plant might rot. Never water in the middle of the day when temperatures are high. I water my cacti in the morning at springtime and in the evening in summer. Add some special cactus fertilizer. I feed my cacti once a month starting from April and until July. When I water my cacti I try to make the whole soil wet. Best rule you can find everywhere: if your not sure don't water. I'm using a toothpick: I stick it into the soil below the surface of the pot. If it comes out dry I water, if it comes out with soil attached to it I don't. Buy a cactus suitable soil mix. It should allow good water drainage. A good cactus soil should have some gravel and/or sand. Top dressing is said to provide protection from some pests. I use it for aesthetic reasons. A good tip I read is to add a piece of paper or coffee filter at the bottom of the pot before you add the soil, so the soil does not gradually come out of the pot holes. Cacti need as much light and sun as possible. A very handy rule is to provide some shade to cacti that have not dense spines and most of their skin is exposed. On the other hand, cacti that are whitish or have very dense spines like the full sun. In winter I have most plants on my balcony and I use plastic to cover them. This acts like a greenhouse and they have some light. Cacti are resting in winter and when temperatures are very high in summer. In winter I don't water them at all and they stay outside even with very low temperatures. On the very hot summer days I water them more days apart than in spring or normal summer days. Low temperatures in winter are necessary for cacti to produce flowers in spring or summer. This is essential for mammillarias, for example, while other species like notocactus, parodia or gymnocalycium don't need necessarily the cold winter rest in order to flower. Find the name of your plant and search for it's temperature preferences. These are only some general tips to care for your cacti. As I mentioned above, there are always some exceptions. For example, some cacti loose their roots if left unwatered for a long time during winter, others cannot survive if temperature drops below 15o C. In my case, I lost most cacti because of over watering and pests. If you are really interested in building a small collection, my advise is to purchase some special cactus care book. There you will find info on pests and diseases, special considerations for some species etc. You can find also a lot of information on the web. Visit my cactus links directory to choose from a great variety of cactus websites. 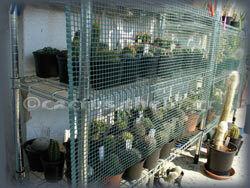 Finally, you can visit the forum and share your knowledge and get help from others about cacti.